Alternative keyboard layouts like Colemak and Dvorak are nothing new; they allow easier access to more often used keys to reduce the strain placed on the hands during typing. 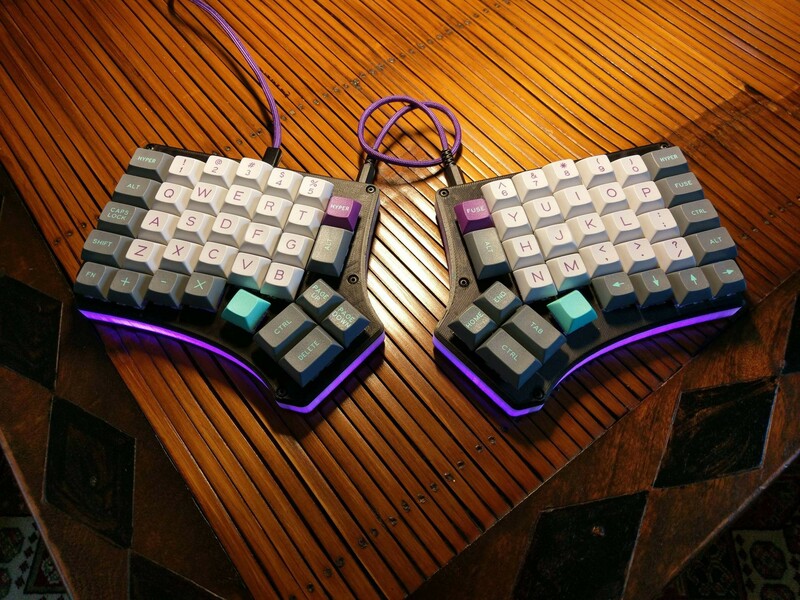 Building on the popularity of the ergonomic Ergodox keyboard, [Mattia Dal Ben] has developed the Redox keyboard, the Reduced Ergodox, to make an even smaller, more ergonomic keyboard. Like the Ergodox, the Redox uses a columnar layout, where the keys are laid out in columns, each column offset based on the corresponding finger. Where the Redox breaks away from the design of the Ergodox is the thumb keys. [Mattia] started having pain in his pinkies, so he wanted the thumb layouts to take away some of the extra work from the pinkies. The thumb cluster is smaller than its ancestor and includes an additional rotated thumb key. The Redox has some great improvements over the Ergodox in order to help with the types of strain injuries most associated with typing, hopefully leading to a much nicer interaction with the peripheral that gets the most use. The mechanical keyboard community is constantly coming up with great new designs and different DIY keyboards and we’ve featured many of them on the site. After you’ve checked out the pictures and schematics [Mattia] has created, take a look at this 3D printed mechanical keyboard, and details of a keyboard design and build were presented at the Hackaday Superconference in 2017. Can’t read the keycaps in the article pic or the link. That’s not the least ergonomic ;~) I can’t see which are the enter or backspace keys in the pic! Spacebar? Gosh, only the most-used keys, should be obvious, but I guess I’m blind today. Generally, if you are running a custom keyboard, you have memorized the locations of all the keys already. Some people even go as far as having blank keycaps on every single key. I personally have my spacebar on my left thumb cluster (about where the ctrl is on the redox). I have an ergodox. If you’re reading your keys, you’re doing it wrong. I was reading the article, I don’t have this keyboard, I have a normal one at which I didn’t look once to type this. Better picture. I’m guessing the unmarked turquoise keys are spacebar and enter, though I certainly don’t know for sure. I notice there’s three ‘hyper’ keys, two ‘fuse’s, four ‘alt’s, and three ‘ctrl’s, in addition to a ‘shift’ and a ‘fn’ key. That’s a total of 14 bucky bits, or 16384 possible values for each other key. Still not enough for all of Unicode. One other thing worth noticing is the caps lock key. Why would anyone have a caps lock key on a custom layout? Who hurt this person? It may just be a nice key cap set that the creator enjoys rather than what the keys actually do. I have an Ergodox and a Planck and don’t have any printing on either, because so many of the keys have multiple duties. I wouldn’t mind if there were writing on them though, I don’t look at them. Hi, the text on the keycaps doesn’t mean nothing. The default keymap use Backspace and Del on the two biggest keys on left half, Enter and Space on the right. Anyway you can create your own layout and flash the firmware via USB. As a guy working in healthcare IT, I was perplexed because Redox is a healthcare company (https://www.redoxengine.com/). It’s also a chemical process. I love the layout, however each person’s finger lengths are different. It would be awesome if each column could be adjusted in relative position to each other. Using similar sized devices for each hand, I would recommend the case be made out of metal and good grips be added to really prevent it from sliding around due to the reduced mass for each hand. As a long-time former user of Microsoft Natural keyboards of various forms, I love the Redox keyboard. I’ve built two of them now (build logs at https://imgur.com/a/DzFYMhc and https://imgur.com/a/eEi0gJ1 ). It’s great to see the continuing development, and the iteration toward wireless is looking quite tempting. Nice build! I love the tenting you did. Eyyyy I see that Indy back there! Just an old case, or does it run too? Those are really great! Also super impressed with the 3D printed keycaps. I never sanded mine down and didn’t really care for the unsanded caps. How do you like SA? I quite like SA and I think I could happily go for a “real” set of them or /dev/tty keycaps, budget permitting. (and to the other commenter, the Indy is serving as a monitor stand. One day I may attempt to either boot it or turn it into a case for something more useable). I’ve got an original MS natural that I dig out from time to time to rekindle my hatred… well I mean, see if my hands are screwed up enough yet it makes sense… IDK what it is, I just can’t get comfy with it, feels like it is either designed to use on your stomach while lying flat in bed, or expects you to have 15″ of clear desk for your forearms to lean on in front of it. I kinda dug the MS natural meeces though, used up quite a few.